Two men are wanted by police as witnesses to an incident where a man was struck down by a 4x4 vehicle in Nottinghamshire. Police are appealing for information after a silver BMW X5 4x4 collided with a pedestream near the Hill Crest Farm Shop on Stinting Lane, Forest Town, Mansfield. Officers believe the two men pictured may have witnessed the incident and have important information which could help with the investigation. 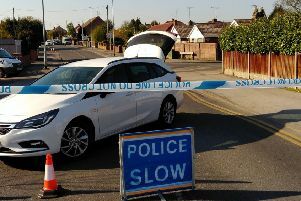 The man in a grey t-shirt was driving a hire vehicle from TPA Portable Roadways in Worksop and officers believe he witnessed the incident take place. The man dressed in a red t-shirt arrived at the farm shop shortly after the incident and may have seen what took place. Police have only just released details of this incident, which took place at around 11am on November 7, 2015. Anybody who may know the potential witnesses or can help with dwetails of the incident should call Nottinghamshire Police on 101 or Crimestoppers anonymously on 0800 555 111.